Successfully warding off increasingly sophisticated attacks in the virtual realm calls for a holistic and multilevel approach. For InfoGuard, cyber defence involves all aspects and levels: from effective prevention, through early recognition of hazards and prompt analysis of incidents to a swift and effective response in an emergency. We established our ISO/IEC 27001 certified InfoGuard Cyber Defence Center for this purpose. The Cyber Defence Center pools all the knowledge of our experts and all our services. 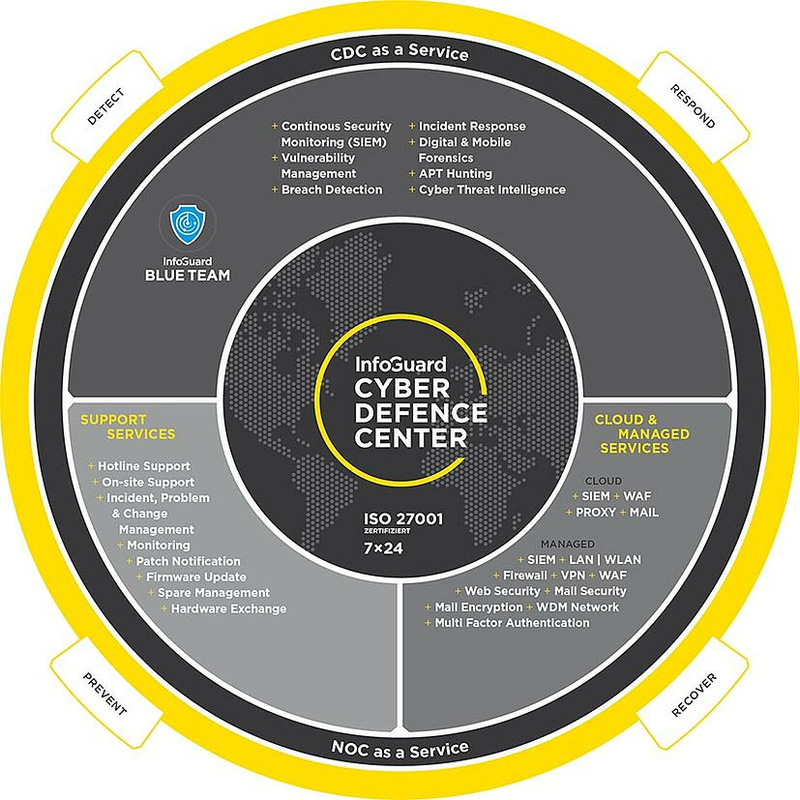 Whether professional support, specific service modules or permanent monitoring and analysis of data traffic by our SOC (Security Operation Center), our Cyber Defence Center with its highly professional defence system offers security for companies without them having to acquire the expertise themselves and, when cloud services are used, without any infrastructure investments. A robust defence system kicks in before a potential attack. The latest threats and attack tactics must be constantly monitored and all relevant incidents meticulously analysed and evaluated because, in an emergency, speed of response is of the essence. Our multilevel cyber defence encompasses all phases and elements of an effective defence system. They are also available to companies as modular services as and when needed. Prevent: All information on security incidents, attack methods and risks is systematically recorded and analysed. Detect: The relevant systems and the data traffic are permanently investigated for suspicious patterns. Assess: All incidents are systematically assessed and prioritised based on their potential to cause damage. Respond: Attackers are isolated in real time, possible channels through which malware could spread are immediately closed and any corrupted systems are quickly restored. The exposed systems and data depend on the business model and organisational form. Our comprehensive service portfolio enables companies to specifically secure their critical areas or strengthen their existing defences precisely where needed. Our SOC (Security Operation Center) provides highly professional monitoring and analysis services. The cloud and managed services are aimed at individual application and technology areas. Our support services provide the professional support of security specialists who work at companies. Our Cyber Defence Center forms the heart of our cyber defence & resilience activities. Here, highly-qualified specialists ensure the secure and reliable operation of all security and network infrastructures. Our own, certified Cyber Defence Center (CDC) in Switzerland monitors all of our customers' services, rectifies faults, configures changes and undertakes system updates - worldwide, 24/7.